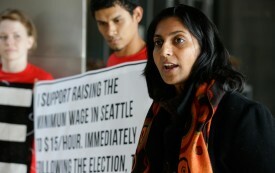 Kshama Sawant is a Seattle City Councilwoman and a member of Socialist Alternative. 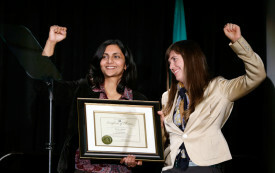 Kshama was first elected in 2013, running as an independent, and accepting no corporate money. 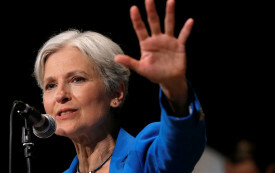 She campaigned on a $15 minimum wage for Seattle’s workers, and taxing the rich to fund education. 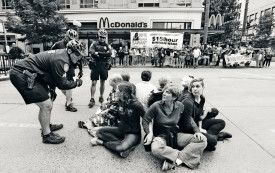 After helping lead Seattle’s 15 Now movement to victory, she was re-elected last year, despite the determined opposition of Seattle’s Democratic party establishment. Most progressives will vote for Clinton to keep Trump out of the White House. That’s understandable, but even more important is building an alternative to pro-capitalist parties. Hillary’s “support” is welcome, and a sign that our movement has come far, but let’s be clear: She hasn’t always supported a $15 minimum wage.